Halloween is tomorrow but many of you may not know that today is National Candy Corn Day. Opinions are split about the merit of these seasonal treats but we at Shine have a soft spot them. It may be the childhood memories they evoke or our need for a quick sugar boost as the days get shorter and colder, but whatever the reason, you can always find some lying around our offices in late October. 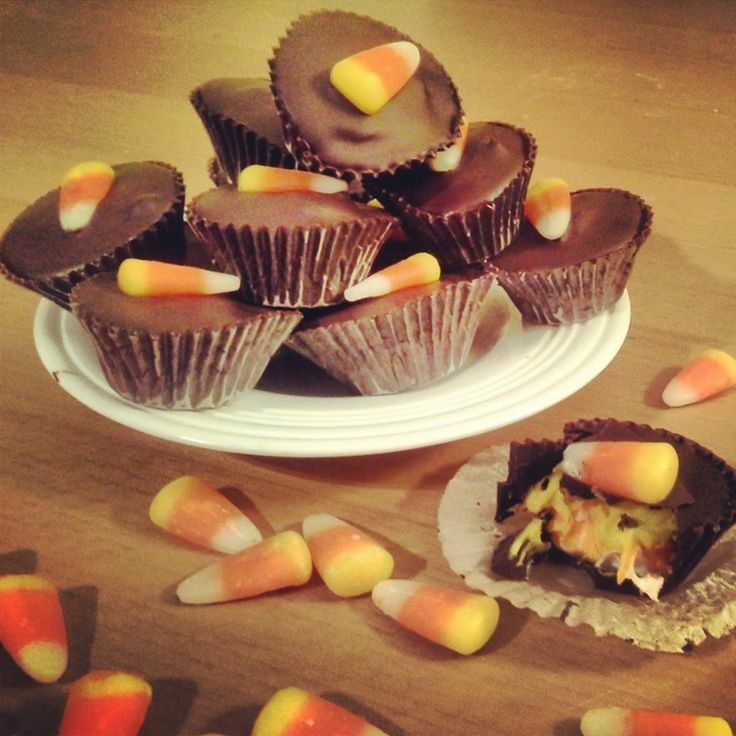 Here is Shine’s recipe for Candy Corn Cups. Sweet, decadent, and over-the top, they stray from our normal health-minded recipes – but Halloween and National Candy Corn Day only come once a year. Live it up! As the sun sets earlier in the October sky, there’s a slight chill in the air that can mean only one thing… It’s almost Halloween! There’s no better way to celebrate the ghoulish holiday than with candy corn, one of the most classic of Halloween candies. This candy corn-themed recipe is not for the faint of heart, as it is quite the tricky treat to make, but I guarantee these candy corn cups will be a scream at any family Halloween party! In a stovetop double boiler (a glass bowl over a sauce pan of boiling water), slowly melt the chocolate. Once smooth, remove the chocolate from heat. Using the pastry brush, completely line the bottoms and sides of the cupcake wrappers with the melted chocolate. Keep the layer of chocolate thin, like a coat of paint. Place the cupcake wrappers into a freezer for about ten minutes, allowing the chocolate to harden. Once the chocolate is set, add a second layer of it and freeze again for ten minutes. While chocolate is setting, divide the frosting into three bowls. In one bowl, add and mix in the yellow food coloring until it has reached your desired shade of yellow. In another bowl, add and mix in the orange food coloring. Keep the third bowl of frosting white, and then place each of the three frosting colors into separate piping bags with star tips. Once the chocolate inside the cups is set, pipe the frosting in three separate layers inside them; first white, then orange, followed by yellow. Cups should be filled with icing just below the top of the wrappers. Freeze for another ten minutes. Top each candy cup with another layer of melted chocolate, completely filling them to the top of the wrappers. Place a candy corn piece on top of each cup and freeze for a final ten minutes, until chocolate is set. Enjoy!